1) Bangalore --100Kms--> Mandya --26Kms--> Srirangapattana --20Kms--> Elivala--31Kms--> Hunsuru--45Kms--> Gonikoppa l--16Kms--> Virajpet--26Kms--> Kakkabe. Road condition of second route is better than first one. Public Transport ( From Bangalore): Catch KSRTC buses to Virajpet from Satellite bus-stand . Then change bus to Bhagamandala, get down near Kakkabe (Aramane stop which is 2 Kms before Kakabe). 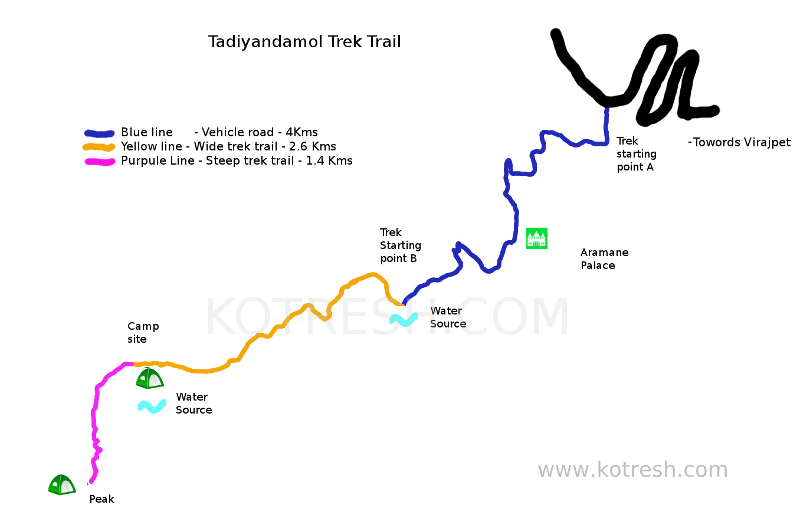 Here is map of Aramane / Palace trek route. Peak is 8 Kms from main road(Main road is marked in Black colour). If you are travelling by public vehicle : Get down just 2 kms before Kakabe (from Virajpet side). Get down just after zigzag curve. you can request to stop at Aramane/Palace stop. This is your starting trek point which is marked as "Trek starting point A" in above map. You required to walk 4kms the road which is marked in blue colour in the map. If you are travelling by private vehicle : If you are travelling from Virajpet route then just before kakkabe you will hit zigzag road which is marked in black in above map. Take left just after zigzag curve. You need to proceed in the this road for another 4 Kms (which is marked in Blue colour). Park your vehicle here and this will be your starting point which is marked as "Trek starting point B" in map. You will find small water stream here. You can fill water if you require. Route from here to foothill of the peak is around 2.6 Kms which is marked using "yellow line" in the map. This is mud road. Keep left in Y junction. This stretch is easy. After trekking 2.6 kms you will find big rock which is best place for Camping. You will find water source very much nearby. If you are planning to camp then this is best option. you will find plenty of wood for your fire camp. Wind will be much lesser than peak. After this Big rock, peak is around 1.6 kms far. Trek trail is much steeper. This stretch is marked using "Purpule colour" in above map. you need to cross small stretch of sholla forest. Dont try to take any shortcuts. (We tryed out and missed our way for some time :) ) Hardly 4 - 6 tents can accommodate in the peak. [Warning : On the peak there will be high speed wind. You check weather report just before going,] Just after rainy season finding wood for fire camp will be difficult, you need to carry this from base camp. Stretch marked in blue line is very easy(4kms), Stretch marked in yellow line is easy (2.6Kms), Streach marked in Purple colour is Moderate. You can find different answers in different blogs. Actually it depends on 1) which route you are taking 2)From where you are starting your trek. In Aramane/Palace route you can start your trek from main road which is marked as "Trek starting point A" in above map. Distance from "Trek starting point A" to Peak is 8 Kms one side. Trek distance from "Trek starting point B" to peak is 4 Kms . There are two best places for camp. 1) At the foothills of the peak that is near to the big rock. This is best place for camp. You will get water near by. Big rock gives you protection from water. Ground is flatter for camping. you will get wood for campfire. 2) At the peak. Only 4-6 tents will accommodate at the peak. So if you are trekking in long weekend then better reach early to the peak. But there is no water at the peak. so you need to carry. Normally high wind will be there at the peak so just check wind in weather forecast. 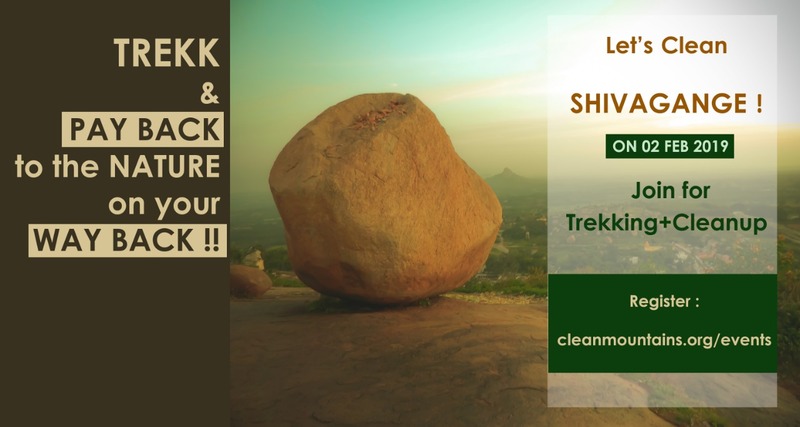 YOU WANT TO JOIN WITH US FOR MAKING TREK TRAIL MORE CLEANER ?